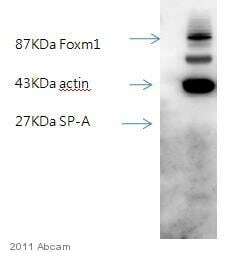 ab51891 is specific for human pulmonary Surfactant Protein A/PSAP. 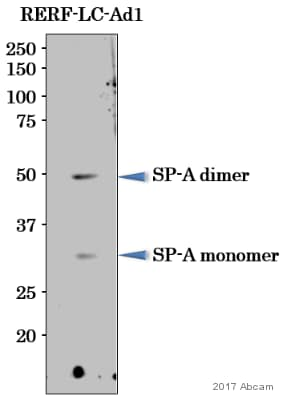 Full length native protein (purified) corresponding to Human Surfactant Protein A/PSAP. Our Abpromise guarantee covers the use of ab51891 in the following tested applications. WB 1/1000. Predicted molecular weight: 26 kDa. ab51891 staining sections of human lung at 1:3000 dilution. Immunoreactivity is seen with alveolar type II cells, nonciliated bronchial cells and a subset of alveolar macrophages. Additional bands at: 50 kDa, 63 kDa. We are unsure as to the identity of these extra bands. Surfactant Protein A/PSAP contains a number of potential glycosylation sites and other post translational modifications (SwissProt) which may explain its migration at a higher molecular weight than predicted. Publishing research using ab51891? Please let us know so that we can cite the reference in this datasheet.